The New South Wales Government (government) has lodged a submission with the Australian Energy Market Operator (AEMO) in relation to AEMO’s Integrated System Plan (ISP). The ISP was recommended by the Independent Review into the Future Security of the NEM (Finkel Review). What makes a successful renewable energy zone (REZ) and, if REZs are identified, how to develop them. 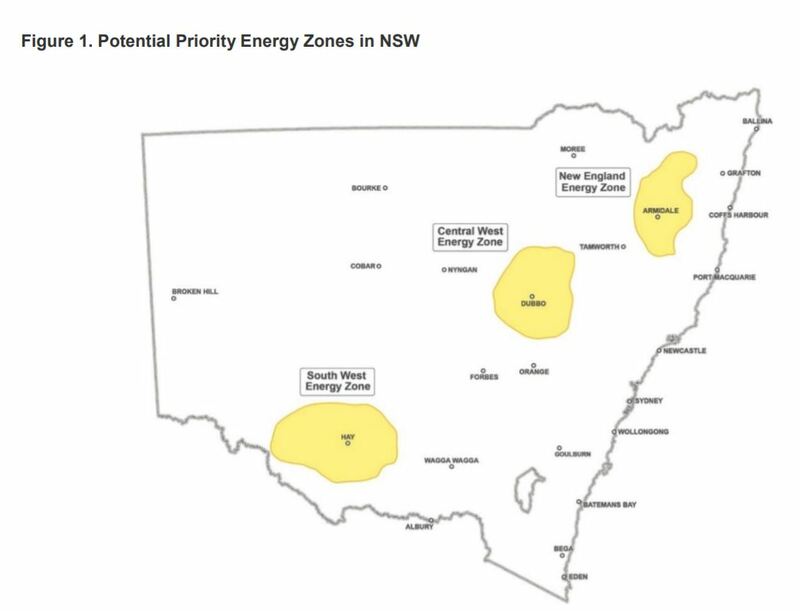 ‘Independent geospatial analysis overlaying 25 NSW data layers has identified the potential for ten Energy Zones in NSW, including three potential priority Energy Zones in the state’s New England, Central-West and South-West regions, as shown in Figure 1. These locations benefit from outstanding energy resources, have reduced environmental and planning constraints, are close to existing transmission and distribution infrastructure and load centers, and align with the Government’s regional growth priorities, developed in consultation with regional communities. Combined, the three priority Energy Zones could unlock 77,000 megawatts (MW) of new generation capacity. Complemented by emerging energy technologies, energy efficiency, and demand response, this would be more than enough generation to meet future energy needs’. ▪ Energy resource and geography – the level of solar, wind and bioenergy resources and other factors impacting generation capacity in particular locations, including site slope, slope aspect, site elevation and geology. ▪ Cost-effectiveness – proximity to existing transmission infrastructure and load centres, encouraging efficient investment and limiting energy losses. ▪ Environmental, heritage and land-use considerations – potential land-use conflict or impacts on sites of environmental and heritage value, including Biophysical Strategic Agricultural Land. ▪ Contribution to a strong and diversified economy – NSW Government regional development priorities, developed in consultation with regional communities, as well as local and state-wide economic growth goals. ▪ Investor and community support – proximity to existing energy project pipeline where investors have demonstrated an interest in particular locations, and proximity to regions with community support for renewable energy projects, as identified through the NSW Regional Plans. ‘The Government acknowledges AEMO’s central role in developing an Integrated System Plan and identifying locations for Energy Zones across the NEM, from an energy system perspective. 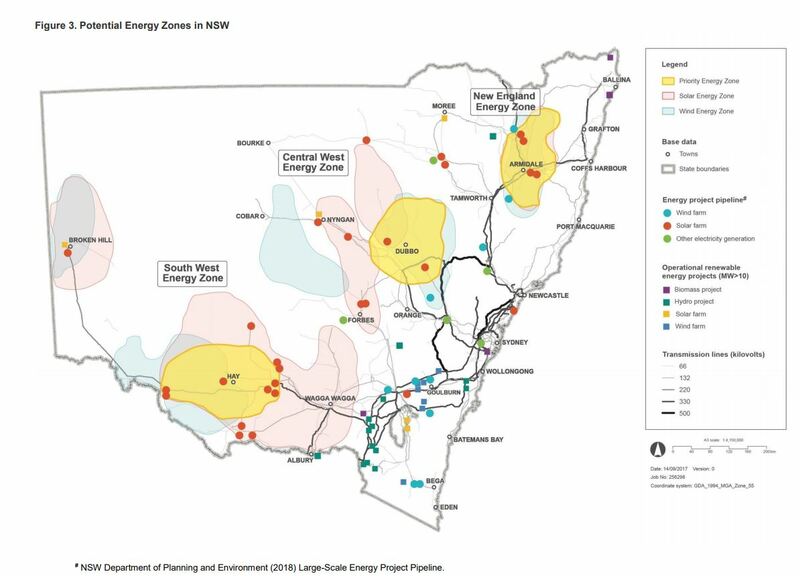 However, the NSW Government is well-placed to identify the best locations for NSW Energy Zones from a strategic cross-sector and state-wide perspective, accounting for a broader range of relevant considerations’ (at page 7). Further information is available on the AEMO ISP page and the NSW Government Planning & Environment, Resources & Energy page. If you would like to discuss this in more detail please contact the team here at Compliance Quarter by clicking here.